a type of disposable face mask used to deliver a controlled oxygen concentration to a patient. (See also oxygen therapy.) The flow of 100 per cent oxygen through the mask draws in a controlled amount of room air (21 per cent oxygen). Commonly available masks deliver 24, 28, 31, 35, or 40 per cent oxygen. At concentrations above 24 per cent, humidification may be required. Called also venturi. A Venturi mask for precise oxygen delivery. From Ignatavicius and Workman, 2000. Giovanni B., Italian physicist, 1746-1822. See: Venturi effect, Venturi meter, Venturi tube. a tube with a decrease in the inside diameter that is used to increase the flow velocity of the fluid and thereby cause a pressure drop; used to measure the flow velocity (a venturimeter) or to draw another fluid into the stream. 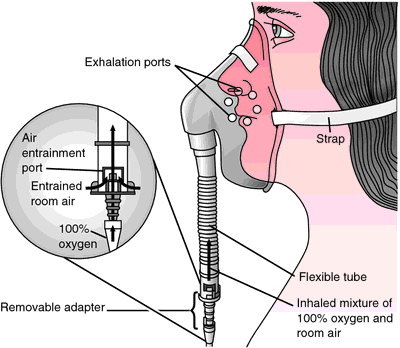 a type of disposable mask used to deliver a controlled oxygen concentration to a patient. The flow of 100% oxygen through the venturi draws in a controlled amount of room air (21% oxygen). Commonly available masks deliver 24, 28, 31, 35 or 40% oxygen. a type of nebulizer used in aerosol therapy. The pressure drop of gas flowing through the venturi draws liquid from a capillary tube. As the liquid enters the gas stream it breaks up into a spray of small droplets.